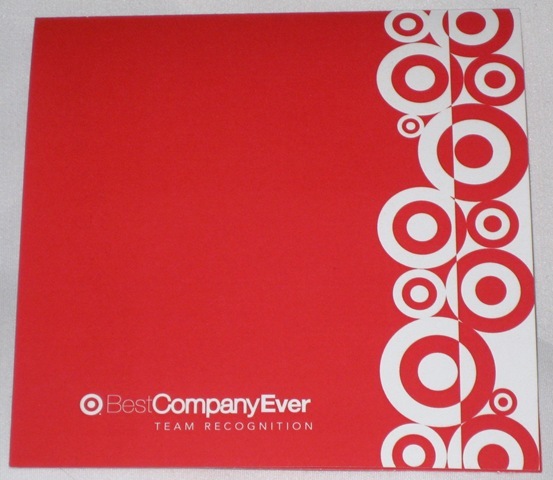 For the last two and a half years, I've been working on helping Target corporation with a project to bring a dashboard reporting application to work on a mobile device. 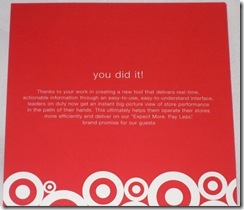 The project has been well received and so popular among store managers, that it's won an award within Target. Not just any award, but the Best Company Ever Award. It feels like winning an Oscar. Why did it win? First and foremost for the vision the business leaders had in providing the software tools that make the day to day life of the store managers easier. The bottom line, it saves time, not just a little bit of time mind you, but a big chunk of time that managers had to spend getting data from multiple systems and from multiple printouts now combined into a real time display of events as they unfold in the store. Everything from unloading of stock on trucks to stocking of shelves and price changes. The vision didn't come easy. Numerous releases were put through the paces before the team hit on the award winning combination with a graphical interface that worked on a touch screen without requiring a stylus. The second reason I believe it won was an extremely high quality deliverable. The last release provided for testing only had one issue reported against over 100,000 source lines. The high quality made for quick pilot and rapid deployment throughout the 1600 stores. The high quality allowed the team to focus on developing new features, and not become encumbered with extensive support issues. The solution was developed by Junction solutions, and the development was completed by the development team at ISS India PLC. I was fortunate to participate as the project manager for Junction Solutions on this project. The application is a true service oriented application gathering data from numerous enterprise and store specific systems to present them in a seamless interface to the store managers. 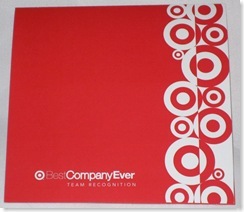 The Best Company Ever award at Target is presented twice a year to the project that is the “Best” overall project within the entire Target Corporation. 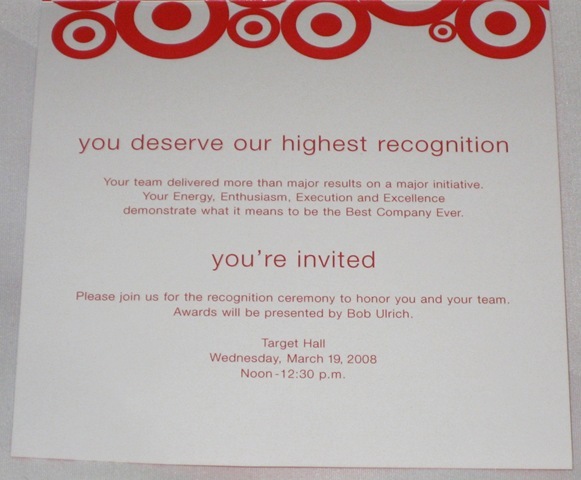 The award is selected from all projects (not just IT) within the company and was awarded to the October 2007 release of iLeader (Automated Leader). Your team delivered more than major results on a major initiative. Your Energy, Enthusiasm, Execution and Excellence demonstrate what it means to be the Best Company Ever. Thanks to your work in creating a new tool that delivers real-time actionable information through an easy-to-use, easy-to-understand interface, leaders on duty now get an instant big-picture view of store performance in the palm of their hands. This ultimately helps them operate their stores more efficiently and deliver on our “Expect More. 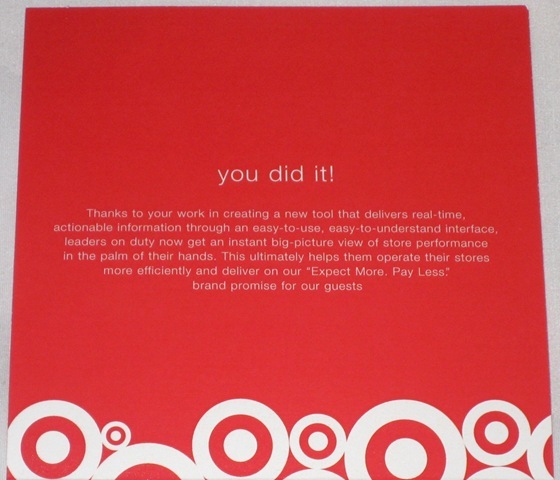 Pay Less.” Brand promise for our guests. 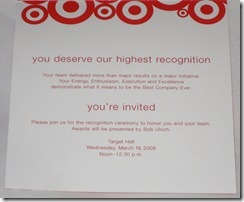 The formal presentation of the award will be Wednesday, March 19, 2008 by the president and CEO, Bob Ulrich.